Episode 94 - The Dark Age is now unquestionably upon us. The elder Kurus, living austere lives in the forest, found themselves consumed by a forest fire of their own creation. Let this be a lesson to all you Hindu campers out there to douse your sacred campfires!! 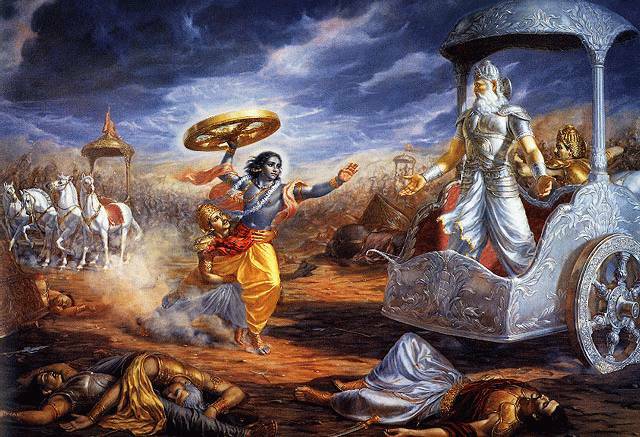 18 years later, things go from bad to worse when news arrives of the death of Krishna and all his relatives. This story alone is deserving of an extended treatment, but we only get a sketchy account of how things went down. With the death of the Vrshnis, Krishna's work on earth is done. He accepts his fate and embraces death when it comes to him. The Kali Yuga is here to stay, so I'll warn you now, don't expect things to get better! I am an Indian and 33 year old, I have been listening your pod cast for last 6 months, I want to thank you for your effort and simple explanation of the Mahabharta epic. I never knew how Krishna died, now I know it. At home we worship various indian Gods on various occasions, like Ram, Durga, Laxmi, Ganesh, Shiv and Hanuman. But we never worshiped Krsna... But now I feel i am in love with Krsna. Thank you very much for helping me deciding which hero should i follow, now i know the path to follow and will soon know my Karma to do. That's fantastic. I've noticed that one thing I bring to this epic as a foreigner is that I do not have many pre-conceptions about these characters. Hindus have such a strong reverence for the Pandavas and Krishna that it sometimes clouds their ability to read the text as it is. What I mean is that they tend to look past the characters' foibles, like Arjuna's pride or Krishna's tricks & manipulations. On the other hand, it worried me that it might challenge the faith of some listeners. So I am relieved that you are able to get something positive out of this. Does the Biblical Shemitah Jubilee Signify the Beginning of the End of the KALI YUGA?